I was at a dinner party, Palestinian style, last evening, in Aqraba. Our host was Ghassan, our service-taxi-driver (he usually smiles more than this). His mother, who has 76 grandchild, was there. So was his wife, 6 children, brother, sister-in-law, and their 5 children, and his sister. Some others came and went. We all sat in one room. It was cold, a tiny gas heater near grandma took the edge off for about 3 feet. And it was crowded. And it was strangley very good. Grandma had almost as many stories as she had grandchildren. And Grandma, as Grandma’s are entitled to do, shared several stories with us. Of course each was in Arabic and required translation. One of the stories stuck with me. 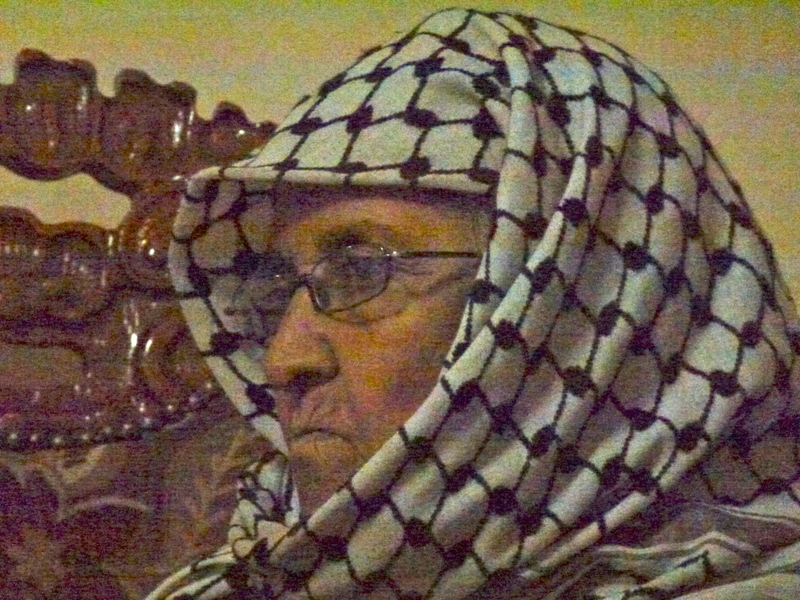 It was the day the Israelis almost killed her son. At that time both Ghassan and the occupation were two years old. The family lived above he Jordan valley, in Aqraba, where they still live now. Grandma’s story was essentially quite short. One day while she was out milking her sheep, less than 30 meters from her tent, the Israeli army shot a rocket at their makeshift home and destroyed it. “They almost killed us” she said, and then she smiles at Ghassan and reminds us that “when he was only two he always stayed close to me”. Both were unhurt, but that evening she demanded that husband move the family back to Aqraba and that her husband come to the fields alone. She said defiantly, “if the Israeli’s are going to kill me I want it to be near my home not out in a field”. Before and after Grandma’s story telling we were entertained with poetry recitals. I vaguely remember a time in our culture when parents would take great pride in having their children recite poetry to adults. It all felt strangely familiar but completely different than anything I had seen in a long time. 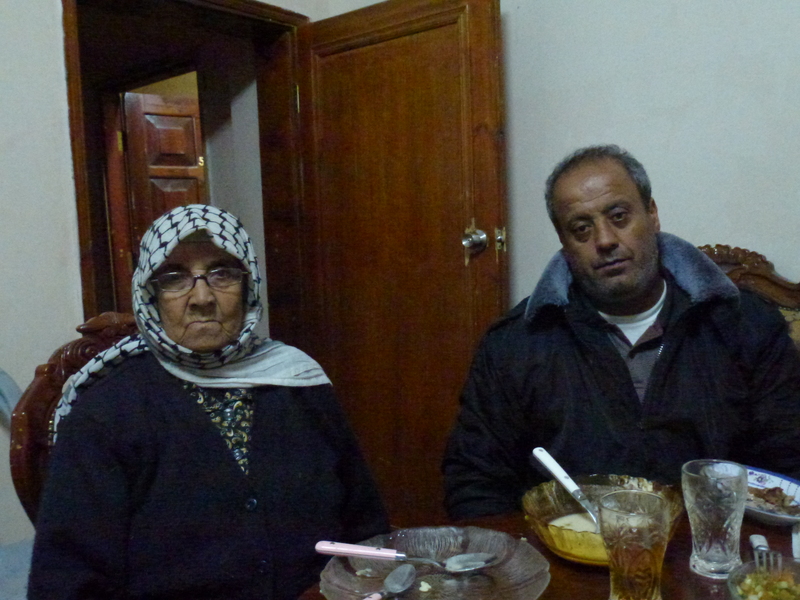 Over time Ghassan’s family has had all their land in the Jordan Valley stolen. Aqraba, Ghassan’s home, is a town of 10,000 people and this community has had over 100,000 dumas stolen in the Jordan Valley. The Jordan Valley is almost 30% of the West Bank and contains almost all of its best agricultural land in the West Bank. At he moment Palestinians have access to less than 25% of the land in the Jordan Valley. The rest is controlled by Israeli Military and Settlers. Before supper one of Ghassan’s daughter, dressed in traditional Palestinian dress, recited, with delightful energy and intensity, a patriotic, pro-Palestinian poem for at least five minutes in Arablic. And after supper she recited it, with great pride, again. The food was good, the entertainment was homegrown, original, and presented with great pride. The highlight for me was when Ghassan encouraged he oldest daughter, a shy 16 year old to recite something for us. With gentle pride, and a hint of teen age embarrassment she started to recited the following poem by Mahmoud Darwish, a Palestinian poet. Once she found her voice, she recited it the way Holy Scripture ought to be read, as if it really contained something important, both life affirming and life giving. As she told the poem, each “…and be gone” became a little clearer and stronger. As for us, we have to live as we see fit. And we have things to do in our land. Or to the time of the revolver’s music! A homeland fit for oblivion or memory. O those who pass between fleeting words! I like to be optimistic- a standard phrase that falls off my lips daily is “It’s all good”. And yet, hearing of the reality of those with whom you spend time, Thom, reminds me of how facile my phrase is. There is good- but not always, not everywhere, and possibly not where injustice and oppression reside. And the poem reminds me of how easily we can become tourists to the pain of others. the nausea other feel for trite maxims.